Posted on April 21, 2014, in 5-7-5, Arizona, Blue Monday, Haiku Horizons, I Heart Macro, Macro Monday 2, Shine the Divine, Southern Arizona and tagged daughter, empty, funeral, laughter, Southern Arizona, sweeps, swing, wind. Bookmark the permalink. 34 Comments. A heartfelt prose 😦 but the blue invited us to cheer us up in a warm sunny day with blue skies. Oh this is so sad x I pray that the little one will be at peace and her family can find comfort and consolation. Very sad . Touched the heart. Ooo, the haiku made me S T O P. It’s chilling. Now, as to the blue . . . this is perfect for Blue Monday. Thanks for sharing. Yessad the swings are happy with the kids! The photo and words stop you in your tracks, very powerful. my heart weeps at this. Very powerful words. I love the choice of photo-hits the spot. This is deeply sad. Hope it’s not personal! How sad. It’s never easy when a child passes away. Powerfully written………its impact felt in the heart. Very sad–hearbreaking emotions.. excellent haiku on the subject of empty. Your real story is MUCH sadder than my imagined one. Oh, this is a sad one, but beautifully penned, MMT! Lovely photo and haiku, too. What a nice and original photo ! 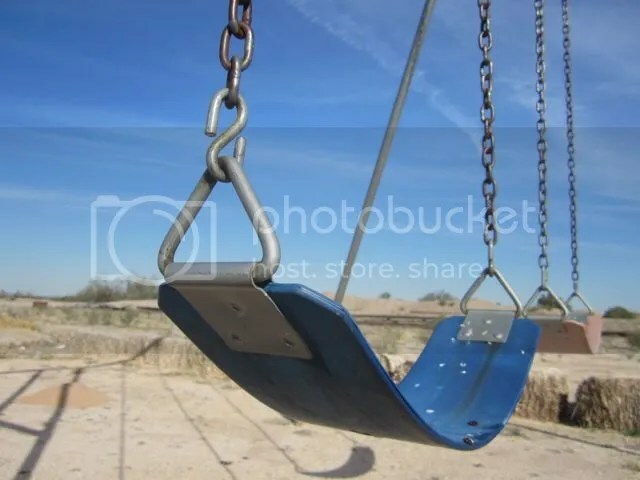 There is always something sad about an empty swing I find. great photo and the sky looks cheerful. Oh, that’s sad! I was relieved to read your responses in the comments. This went straight through to my heart. A drive-by haiku. 😉 Loved it. omg MMT ,it has an eerie quality …. Too many go too soon.